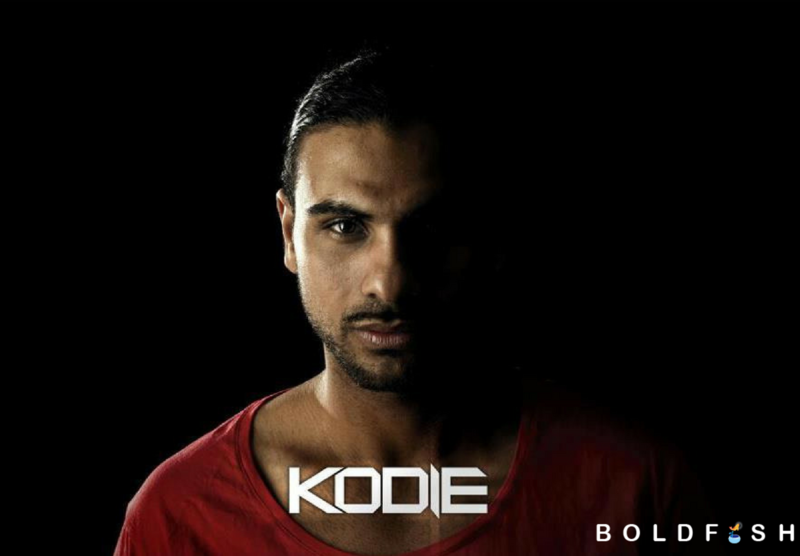 Kodie recently caught BOLDFISH’s eye with his latest hit, Phone Down . The lyrics around social media overload and around his search for digital wellness, resonated with us. After listening to the song on repeat, we had to reach out to him. Kodie was kind enough to share his journey to balance his digital and analog lives. My name is Kaveh Kabinejad and I’m a 34-year-old recreation instructor/artist/lecturer based in Stockholm, Sweden. As an artist, I go by the name of Kodie and I work with many different genres, among them Hip Hop, Trap, EDM, Reggaeton and Moombahton. I’m a former Swedish boxing champion and a vegan. What is the main inspiration for your music? Healthy living. I always strive to improve and become a better version of myself, both physically and mentally. The important things I learn about happiness, the good and the bad things that are happening in the world, the people I see, the everyday struggle — these things inspire me to write songs. I write lyrics to inspire people to take care of their physical and mental health. I encourage them to work on their issues whatever they may be. I’ve been working with young people for 13 years now and I’ve learned a lot about coaching. I know how to reach out to lost souls, bring out their best and guide them to live a good life. With music as my tool, I reach out with uplifting messages. How do you use your phone on a regular basis? Before going to bed every night I put my phone in the kitchen so that I can’t reach for it when I wake up in the morning. I also power down my computer an hour before bedtime. When I wake up, I shower and eat breakfast before checking my phone at all. I spend around 15 minutes answering text messages and go on social apps for work before heading into the office. During my 35-minute subway commute, I listen to either music or podcasts. At work, we are not allowed to use our phones unless it’s work-related or an emergency call. The only time I get to use my phone freely at work is during my lunch-break. That’s when I spend around 15 minutes answering emails, texts, calls, and checking my social media. On my way home, again, I listen to either music or podcasts. At home, I spend maximum an houranswering emails, texts, calls and checking social apps before going to bed. Do you have any rules for yourself regarding phone usage? I have set strict habits around phone usage that I follow. Maximum 45 minutes on social media per day, if I exceed it, I must delete the app I’ve spent the most time on for two days. Never have my phone in my hand or on the table when I talk to someone. I want to give whomever I’m talking to the impression that I’m listening. It’s a matter of respect. Never walk while looking down on my phone. It’s important to be aware of my surroundings. If I need to do something on my phone I stand somewhere where I’m not in people’s way. Never have my phone in my hand while driving, that’s dangerous. Keep my head in a neutral upright position when checking my phone so I don’t develop text-neck . Tell us the thought process behind your song, Phone Down. I was going through a burnout when I came up with the song. I remember spending 6 – 7 hours a day on my social media apps as an escape. I knew it was not healthy to spend that much time on social media, but I just couldn’t control myself. One day I was sitting on my couch scrolling and “liking” when I got fed up. “Scroll-scroll, like-like.” Is this what my life has come to — just scrolling and “liking,” following other people’s lives? Have I forgotten my own life? I got up from the couch and went to the kitchen while repeating these words in my head, “scroll-scroll, like-like, scroll-scroll, like-like.” Then I started rappin’ them. They were catchy and soon I added “post-post, swipe-swipe, everyday I’m like that.” Right in that moment I felt a strong urge to write about the topic. So I sat in front of my computer, put on a random beat, and wrote a whole verse in 30 minutes. After a couple of months I decided to seek help for my phone addiction. I Googled social media addiction and found this place in Stockholm, Internetakuten , where you learn how to find a digital balance. I got in touch with a therapist named Patrik Wincent and he helped me overcome my addiction. During this time, one of my tasks in the program was to document my process. This diary became more than therapeutic and, through it, I added on to the lyrics I had written a couple of months earlier about my social media habits. I remember writing those lyrics just to get some things off my chest and, honestly, I had no plans of releasing them as a song. I didn’t want anybody to hear my innermost thoughts. They were just too private for the world to hear. But, thinking about the millions of people who probably went through the same thing, I changed my mind. I felt a need to share this important message because phone addiction is a widespread problem without enough awareness around it. I went to the studio with my good friend Andreas “Ndy” Jamsheree and we started working on the song. Ndy produced the beat while I was recording the verses. We came up with the chorus together. The results turned out good. The song was released on January 17, 2018. Upon the release, some of the biggest newspapers in Sweden wrote articles about the song and about my addiction to social media. Me and my therapist Patrik Wincent appeared on the Swedish newschannel TV4 and talked about Nomophobia . Also I was invited to some radio stations to talk about the song and social media addiction. Creatively, I’ve been able to give my fans more than music. For example, I can give my followers personalized pictures, clips, and thoughts to allow for a better understanding of me as an artist. In a business sense, it has helped me reach out to people and places on every continent of this planet, gain the support from big pages, and improve the interaction with my listeners. I have people writing me from many different countries asking for the lyrics to my songs, when my next song will come out, and if I will ever perform in their country. I get messages describing how my music has struck a positive chord within my listeners. It makes me so happy and I’m so grateful for all the love and respect I get. Being a struggling artist, this is what gives me the motivation to continue, knowing that my art is appreciated. Through social media, I have learned a lot about how to promote my music, i.e. getting in touch with Spotify playlist managers and booking shows. I’ve also connected with many great musicians. Almost every producer I work with, I’ve met through social media. Do you have any tips or tricks for people who want to consume or use tech less? Yes. There are many tips and tricks for consuming tech less. Here are some tips that helped me find my balance. Make tech-free zones. For example, put your phone or computer in the kitchen when you go to bed at night. Don’t sleep with devices next to your bed. Get an alarm clock instead of the one in your phone. Make sure you turn off your phone and computer one hour before you go to sleep. If you’re going somewhere and you don’t necessarily need to your device, leave it at home. When you’re talking to someone, leave your phone in your pocket. Don’t talk while looking down on your phone. That’s disrespectful. When you watch a movie or a lecture, don’t pick your phone up until it’s finished. I know some parts of a movie can be a little slow or boring, but don’t pick up your phone. Don’t walk among people while looking down on your phone. Especially when you’re on pedestrian crossings. Find a spot where you can check your phone without being in the way. Turn off your push-notifications. They can distract you. Take a social media detox once in a while, from 1 week to a month. It’s good for the mind. Anything else you think we missed but want to share? Remember: technology and social media are not bad. There are many benefits to them. You can visit pages where you learn new and interesting things; you can make new friends from all over the world; you can promote your art and reach out to thousands of people; you can find inspiration in other users/accounts. There are countless good things out there. You just have to balance your life on the screen and your life in the real world. Use social media in a healthy way. Don’t just sit around scrolling for hours chasing likes, comparing your life to others, and getting depressed. And in the real world, don’t be lazy. Spend time with your family and friends. Go out and try new activities; meet new people and have interesting conversations with them; read books; find new and interesting recipes and cook; visit a historical place. There are so many things to do out in the real world — you just have to get out of your comfort zone and be present. Kodie can be reached via Facebook or Twitter . Check out his music on YouTube .